Warley Park Golf Club01277 224891work Golf - 18 holeWarley Park Golf Club boasts a superb 27-hole golf course. Numerous lakes and mature woodland areas are incorporated into the design of the undulating fairways to provide a relaxing and picturesque backdrop to your round of golf. A fine lounge and restaurant overlooking some of the finest scenery in Essex offers a high standard of service in a friendly, relaxed atmosphere. Chill out on the Terrace Room and Viewing Gallery offering spectacular views of the lakes and the 27th green. 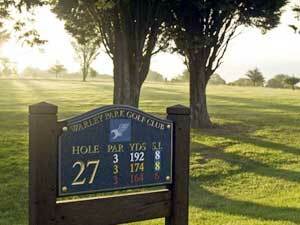 Warley Park Golf Club boasts a superb 27-hole golf course. Numerous lakes and mature woodland areas are incorporated into the design of the undulating fairways to provide a relaxing and picturesque backdrop to your round of golf. A fine lounge and restaurant overlooking some of the finest scenery in Essex offers a high standard of service in a friendly, relaxed atmosphere. Chill out on the Terrace Room and Viewing Gallery offering spectacular views of the lakes and the 27th green. The club is also a great place for your perfect outside ceremony and wedding breakfast.